Progressive presidential nominee Sim Sang-jeung on Wednesday proposed initiating Asia's version of a European peace process to address North Korea's nuclear conundrum and growing regional geopolitical tensions. 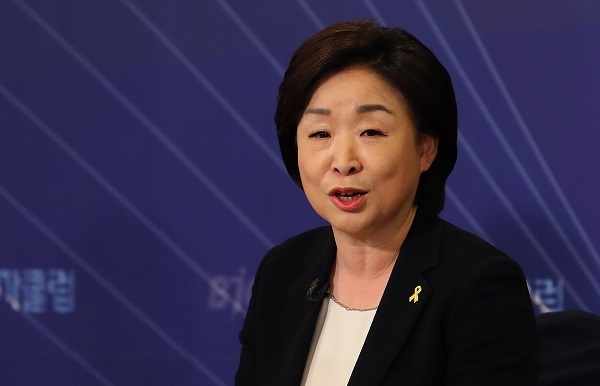 During a debate hosted by the Korea Broadcasting Journalists Club, the candidate of the far-left Justice Party also stressed she has never opposed sanctions or pressure on Pyongyang, saying there have been "great misunderstandings" about her stance on the communist state. Amid deep ideological divisions in South Korean politics, her party has been accused of being sympathetic towards the reclusive state with her right-wing opponents labeling her and her colleagues pro-North Korea. "What I think is important is to highlight that there must not be a war in any case ... Either sanctions or engagement... all of these should, after all, be aimed at securing peace," the labor activist-turned politician said. "There seem to be great misunderstandings about my statements and election pledges, but I want to make it clear that I have been urging neighboring countries to join (sanctions against the North)," she added. To prevent a potential armed clash on the peninsula, Sim stressed the need to create a regional dialogue channel modeled after the "Helsinki process," a European initiative that provided much-needed momentum for reconciliation, cooperation and ultimately enduring peace during the Cold War. "(The dialogue table for peace) could be set up in the process of the United States and China, and countries around the Korean Peninsula calibrating their security and economic interests ... (I) propose the Asian version of the Helsinki process," she said.